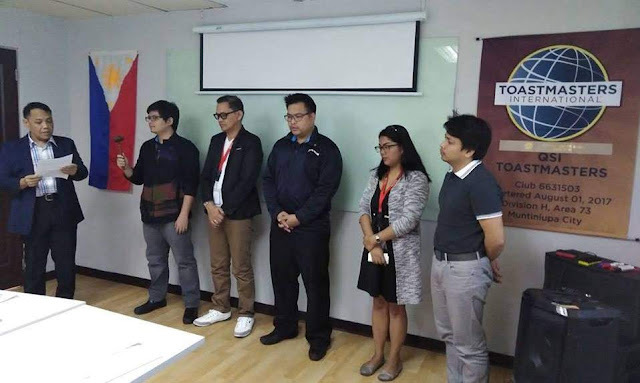 The QSI (Quantity Solutions Inc.) Toastmasters Club had its 3rd Induction of Officers today. This was the third because the first induction had Jandy as the Club President. That was followed by the second induction with Nera as president. Shown below are the new set of club officers (L-R): Joel Brian de la Cruz (President), Nicanor Esplanada (VP Membership), Aldous Pring (VP-Public Relation), Rubilynne Bernarte (Secretary) and Mark Clinton Viriña (Sgt-At-Arms). Initially, it was Division Director Dolly who was tasked to discharge the outgoing officers and install the incoming officers. I was supposed to pick her up at Crimson Hotel. Unfortunately, she had an emergency en route to Crimson and had to seek medical attention. I, on the other hand, performed the installation of club officers. I installed the new members to the club as well. Holding the gavel in the above photo is Joel Brian who was installed as the new Club President. Thus far, Joel has had three speeches and the club looks promising under his leadership. After the induction, Joel gave a speech about his transformation as a speaker. He told a short story of how a lady executive asked him to address an audience at a moment's notice. With his newfound confidence developed in Toastmasters club meetings, all Joel could utter to her was, "yes ma'm." He delivered, and he impressed the audience AND the executive. I thought that was an amazing testimony to what the Toastmasters program has done for him and how he benefited after gaining much confidence speaking in front of an audience. After President Joel's speech, Eve asked me if I wanted to give a brief impromptu speech to the club. That segment wasn't in the program but I said, "Sure!". I jumped off from where Joel spoke. I stressed the importance of hearing more inspiring motivational stories such as Joel's. These are the kind of stories that need to be heard and shared by beginners and old members alike. 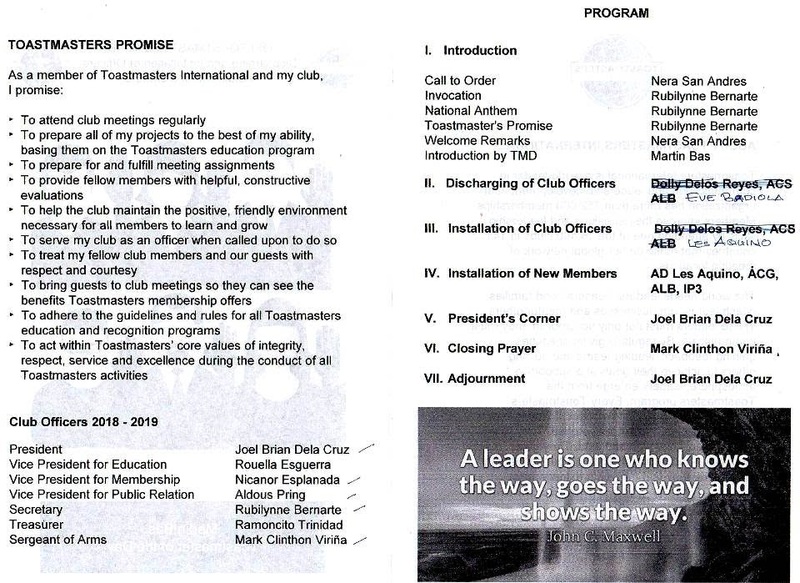 In addition, I stressed that members only gain from Toastmasters what they put into it. That means attending meetings regularly AND participating in delivering speeches and taking roles. Put that effort in and you WILL benefit. It's just the whole "no pain, no gain" concept. I reiterated, this time to the group, that Toastmasters is a continuing educational program. It isn't like a seminar or training like many would probably expect. It isn't a course module that after a fixed period like six months, you say you're done with it and leave the club. That would mean a never-ending entry of newbies with no existing support system to accept and mentor them. Another point I raised was that, we were all members, even Eve and myself. 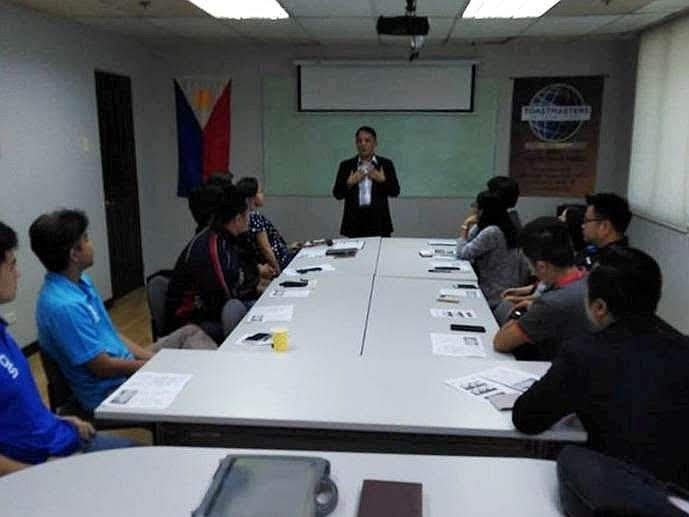 The time and effort that club mentors and district leaders give to the club is voluntary and not paid by Toastmasters International. The only difference, I told the club, was that Eve and I pay club dues out of our own pockets. Not only that, we struggle to look for and pay extras like meeting venues, projectors, sound system, etc. etc, ad nauseam. Compared to community club members, members from corporate clubs have "got it made". I just reminded them to not take their memberships for granted. Yup. I just had to get that one out. Before we adjourned, Eve and I had a brief photo-op with the newly inducted officers. After the meeting was adjourned, we had Jollibee lunch with the club officers and members. 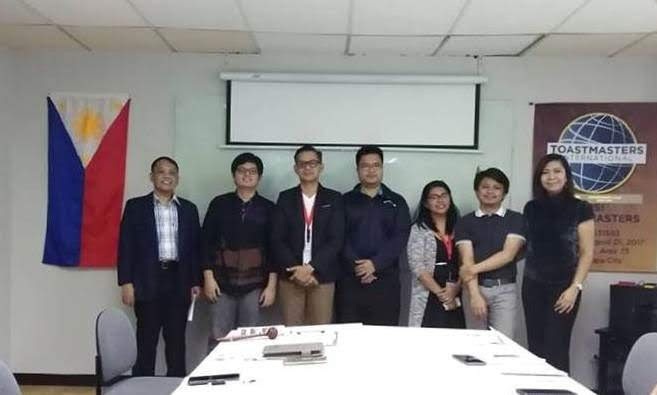 Thank you, QSI TMC! Here's a scanned copy of today's program on the induction of officers.